Curry is one of the most popular dishes in Japan. It is commonly served in three main forms: curry rice (curry over rice), curry udon (curry over noodles), and curry bread (a curry-filled pastry). Curry was introduced to Japan during the Meiji era (1868–1912) by the British, at a time when India was under the colonial rule of the British. Since then, the dish has evolved within Japan taking a milder and a little sweeter taste compared to the most Indian varieties. It has become a much loved dish all over Japan and it is so widely consumed that it can be called a national dish. 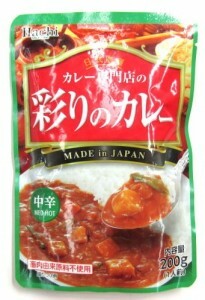 Hachi Irodori no Curry in pouch is delicious, generous-sized, and ready in minutes. This pouch of ready-made medium hot or hot curry sauce is packed with delicious vegetables such as onion, potato, green beans and carrot, warming spices, fruit pastes, and many other seasonings that give the curry a rich and deep flavour. 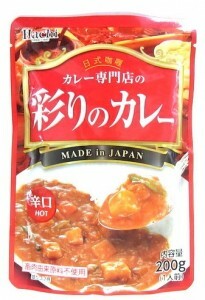 It has no meat products or extracts added, so this curry is also suitable for vegetarians. 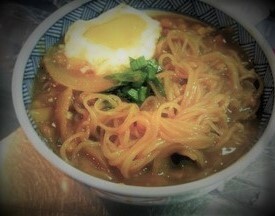 We recommend making curry udon with konnyaku noodles! Prepare the konnyaku noodles. 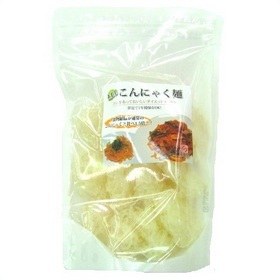 Bring water to a boil in a pot, put in the dried konnyaku noodles. Then remove from the heat, let the noodles rest for 7 minutes. Drain the konnyaku noodles in a colander and rinse them under the tap with hot water (the rising in necessary to remove the tapioca syrup coating). Place pouch, unopened, in a pan of boiling water for 4-6 mins before removing, opening and pouring over the noodles. Add an egg fried sunny side up, and serve with a sprinkle of chopped spring onions. Enjoy!